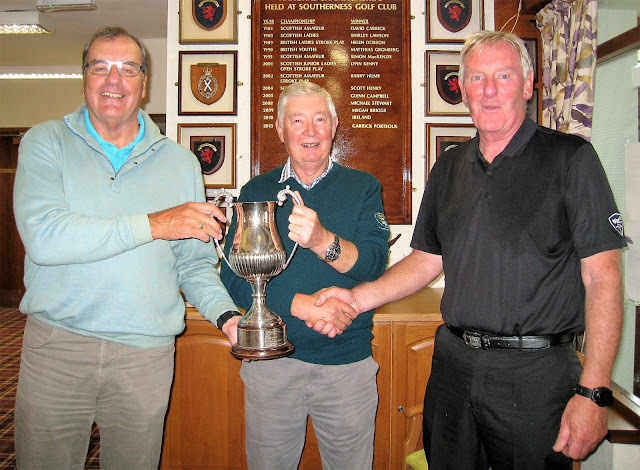 The final of the Kirkcudbrightshire four-ball, better-ball championship took place over the Southerness course, where he men's home internationals will be played. Thirty-two pairs started the championship and the two pairs in the final were both from Southerness Golf Club, Gordon Doig (5) and Donald Hunter (6), and Shane Thomson (6) and Robby McCreath (6). Conditions for the final were anything but ideal with a strong prevailing wind and intermittent drizzle. Thomson and McCreath, four down earlier on, had won back two of the deficit by the turn. They then won the 10th and missed a good chanced at the 11th to draw level but Doig and Hunter ran out winners by 3 and 2. William Watson, president of the Kirkcudbrightshire Golfers, presented the trophy and vouchers to the players after the match. William Watson president presenting the trophy to the winners.